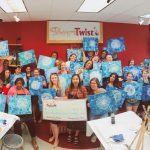 On June 30th, T.E.A.L.® supporters raised over $1,200 during a painting event in Garden City, NY. Guests were able to enjoy an afternoon of painting with raffles and prizes, while supporting a great cause. Thank you to all who organized and attended the event!